BioWare is offering a sweet deal to gamers who buy Dragon Age 2 before the end of April: a free, full copy of the the mega-hit RPG Mass Effect 2. 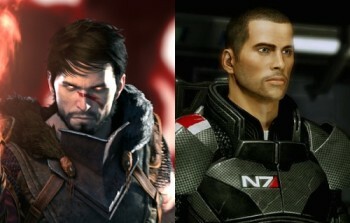 It's called "The BioWare Sequel Celebration," and it works like this. Everyone who buys a copy of Dragon Age 2 and activates its Online Pass content by April 30, 2011, will be given a code to enter at the BioWare Social Network. That code will make a digital copy of the PC version of Mass Effect 2 available through the EA Download Manager, absolutely free. "Thanks to gamers like you, Dragon Age 2 is off to a great start - breaking the one million mark in less than two weeks and faster than Dragon Age: Origins," the company said. "We appreciate your support. As a special thank you for helping with the game's early success, BioWare would like to present you with a download code for 2010's Game of the Year, Mass Effect 2 on PC." Naturally, there are a few catches. Dragon Age 2 owners are eligible for the free game regardless of the platform they purchased it on, but the giveaway is only for the PC version of Mass Effect 2. If you purchased a used copy of Dragon Age 2, you must purchase and install the Online Pass content separately in order to get the free game, and the offers ends at 11:59 pm PDT, no exceptions - so if you snooze, you lose. But a full copy of one of last year's biggest releases, totally free, just for buying a game you were probably going to pick up anyway? No matter how you look at it, that's pretty awesome stuff. A lot of BioWare fans may already own Mass Effect 2 but for those who don't, this is one seriously sweet deal. Full "BioWare Sequel Celebration" details and instructions on how to get your own free copy of Mass Effect 2 are available at the BioWare Social Network. Thanks to Kalezian for the tip. UPDATE: The original report stated, as did the offer FAQ, that the free version of Mass Effect 2 would not include the bonus Cerberus Network content. Something, somewhere, has apparently changed, because the FAQ now says the opposite. "Cerberus Network is included and will be entitled to the account used to redeem your Dragon Age 2 Online Pass," it says. "This includes Zaeed - The Price of Revenge, Cerberus Weapon and Armor, Normandy Crash Site, Cerberus Arc Projector, and Firewalker Pack. Visit the offer page to download the necessary files."